Applications must be completed by 11:59 pm (ET) on August 15, 2016. A chance drawing will be held on September 9, 2016. Everyone is strongly encouraged to help the Department in its efforts to save money by applying for the any-deer permit lottery using the online application. The online application process is quick and easy. Applicants will get instant confirmation of their entry into the lottery. Bonus deer permits will only be awarded in WMD’s where there are more permits available than applications received. If you do not want to apply for an any-deer permit but would like to apply for a bonus deer permit should bonus permits be available, make sure you designate a WMD choice for a bonus deer permit. No WMD changes can be made after the drawing. Bonus deer permits will be distributed to hunters who applied for a bonus deer permit in the WMD where any-deer permits went unused. 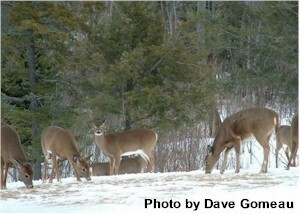 If selected to receive a bonus deer permit you will be notified by mail and there will be a $12.00 fee. Bonus deer permits can be paid for right up to the last day of the muzzleloading season on deer. Bonus deer permits may be transferred in the same manner as any-deer permits. The deadline for the bonus deer permit is the same as the any-deer permit.